Anyway, my mealing planning mostly involved eating out of the pantry and freezer for the last few weeks, but with a paycheck comes groceries. But before I post this week's recipes, I wanted to review a couple from my last menu post. We tried two new recipes from Pioneer Woman: Chicken with Olives and Pasta with Tomato-Blue Cheese Sauce. The first one was completely unexciting and won't be making my On the Menu list. But the Pasta with Tomato-Blue Cheese Sauce was fabulous! I get kind of drooly even thinking about it. I'll be checking out Menu Plan Monday and Tasty Tuesday this week, and of course I always see what's happening with Pioneer Woman. I love adding new recipes to my "Recipes to Try" file. Latest ones include, besides all of the above except the French onion soup: Pumpkin Scones and Swirled Pumpkin Yeast Bread. I also made some yummy cakes recently. One of these days I'll get around to posting the recipes! We have settled into a comfortable rhythm thus far. I am quite sure that, in 11 years of homeschooling, we've never followed such a predictable schedule as we are this year. It wasn't really intentional, but we are all enjoying our days, knowing "what's next." Ten weeks into the year, I can say with absolute assurance that taking a year away from our regular Sonlight studies was the right thing to do. We are all loving going through the Chronicles of Narnia, and I know this is a year they will cherish. I think, in my heart of hearts, that perhaps my main goal of this year was to instill in them the kind of love for the Narnia books that I've carried with me my whole life. Monday: Co-op classes and Moms' Night Out. I enjoyed and very much needed a night out with just moms. In both my literature circle class and my creative writing class, I'm having the kids work together in groups for a project.In literature circle, the groups had to write a poem with a specific character and mood (drawn from a basket) and then get to choose everything else (rhythm and/or rhyme scheme, setting, theme, etc.). In creative writing, they are working in groups on advertising a certain project with a certain advertising technique. I look forward to seeing what they come up with at our next class. and the pencil he has sharpened down to a nub. All the regular things (math, spelling, grammar, essay writing, handwriting). We began reading Prince Caspian. The kids kept saying, "That wasn't in the movie!" Yep. In the afternoon we had a consultation with an ENT for Duncan. We've always known that he is tongue-tied, as his brother and father are. (Both of my boys are in the "we don't clip tongues" generation. Nowadays, pediatricians are again clipping anchored tongues.) But by the time Jesse was Duncan's age, his tongue seemed to have loosened and he was able to pronounce his "R" and "L" sounds fine. A speech therapist evaluated Duncan several weeks ago and said that she'd rarely seen a tongue as anchored as his. We decided to go ahead and see an ENT and made an appointment to get his tongue clipped next Tuesday! I expect he'll have a year of speech therapy coming up as he learns to retrain his tongue. All the regular things. We are halfway through Prince Caspian now, so we're right about on schedule. My plan is to finish Voyage of the Dawn Treader by Thanksgiving, just in time for the movie to come out. We'll take December then to break from Narnia reading and indulge in a good Christmas book. I'm not sure yet what that will be. 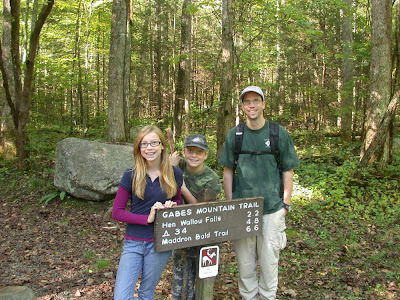 We also had American Heritage Girls and Cub Scouts this week, which takes up most of our Thursday. Duncan is on a Cub Scout camporee this weekend, and Laurel worked for four hours last night doing childcare during a funeral. This was a quiet week, with the leaves changing and the temperature truly getting cooler. The leaves are really falling, and Duncan says, "Poor Daddy. Look at all the raking he'll have to do." He seems to have forgotten his job as Daddy's raking partner. The kids are getting a good dose of life lessons this week in addition to bookwork. Our church lost a sweet man this week to cancer. He was only diagnosed a couple of weeks ago, and his death at age 51 has everyone reeling. Laurel's servant heart was a blessing to so many people last night as she and another girl took care of a dozen kids so their parents could attend the funeral. 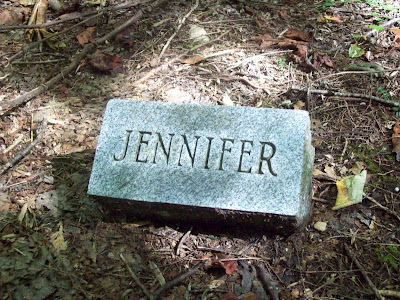 One of our cats has also gone MIA this week. This is the kitty that the kids spoil rotten, wrapping him in blankets and calling him "baby." As the days go by, we lose a little hope that he will come home, but they seem to be dealing with his loss well. We've always taken the attitude that animals come and go, especially indoor/outdoor cats, fish, hermit crabs, gerbils, etc. They've had lots of such pets through the years, and they seem to be pretty accepting of the cycle of life. 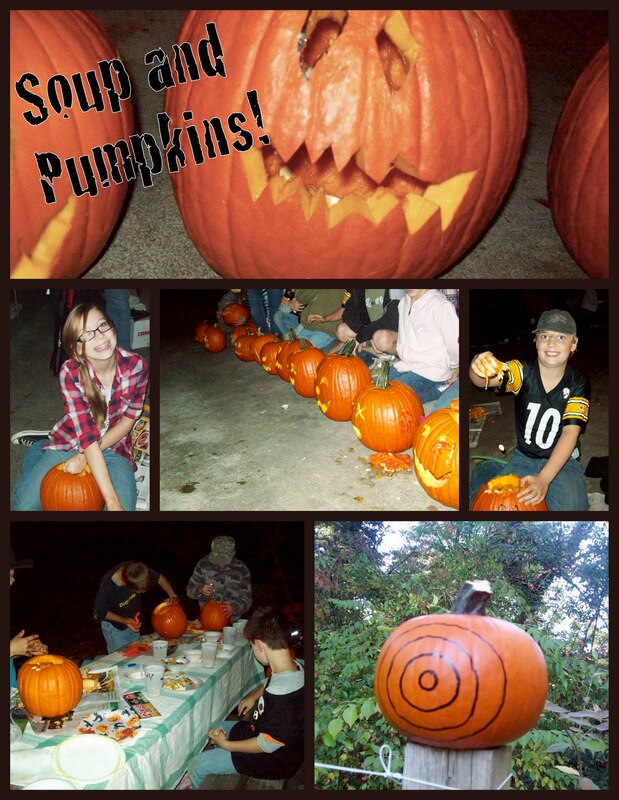 It's our one big party of the year: 50+ friends, crockpots full of soup, BB gun contests, kids running around in the dark, parents relaxing, Guitar Hero, candy, and of course pumpkin carving. It's the one I hope our kids and their friends will reminisce about when they are grown. Maybe they'll carry on the tradition, or maybe they'll still come and bring the next generation. I caught a small slice of perfection this morning as I took the dog out. The wind is strong here and gusty, which is unusual, and quite warm for an October morning. The mountains were clear and the leaves seemed to have peaked overnight, in spite of the warmth. Red so bright I couldn't look away. The moon, just past full, was above our house, and the sun just coming up over the mountains. I sat outside on a bench with my coffee and watched the leaves, and breathed. Yesterday was cluttered with contention and bickering. Seems like everywhere I turned, someone was being mean or melting down or abdicating responsibility. So many undercurrents of discord and deceit. We exhaust ourselves with temporal things. Still, there were glimpses of good things yesterday. Laughter with friends. Friends, period. My mother in her light blue gardening hat. My brave daughter. A compliment about my son. Twenty minutes before bed to talk with my husband, to rehash the day. It wasn't a bad day, but I was happy to sleep, knowing that with sleep comes the gift of a new day. 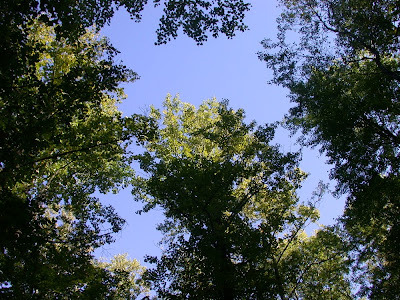 Today: bathed already in warmth and an unearthly glow, a glimpse, an opening of sky, wind in the trees, flurry of leaves. Rejoicing does, indeed, come in the morning. * Seems like all I'm good for this week are ramblings and miscellany. Some weeks are like that. * October 22 always sticks in my head because during my sophomore year in college, my boyfriend quit school on October 22, which would have been his 20th birthday. He disappeared in the middle of the night and went to Florida. I have no idea why. The next day, some of his former band members cornered me in the library and asked me where he was. I really had no idea except that he had gone to Florida. Turns out, as I discovered later, he had stolen most of their band equipment to sell. You know, I'm still really fuzzy on all those details. I often wonder if someday we'll get to see a play-by-play of all those confusing moments in our lives, when we didn't really know what was going on beneath the surface. * But that was a long, long time ago, and an abbreviated version of that story. For over 21 years, I have been married to the boy I met after the one-who-escaped-in-the-middle-of-the-night-with- stolen-equipment. Sometimes happily-ever-after is all that needs to be said. * Tonight is our most exciting night of the year! For many years now, we've been hosting a Soup and Pumpkin party for lots of friends in our home. Everyone brings a pot of soup, an appetizer or dessert, and their pumpkins to carve. We sometimes do pumpkin chunking, too, with all kinds of fancy trebouchets and slingshots, and this year we're adding in an all-new BB gun shoot-the-pumpkin feature. * The Soup and Pumpkin party marks the start of indoor, stay warm, be cozy season. And it reminds us, every year, of how incredibly blessed we are to live in this place with these people in our life. * And now I must return to cleaning, cutting flowers, and making apple crisp. Joyfully. * Some days are like this: Duncan walks into my room in an apron, carrying a stuffed animal with a chef's hat on. "Let's make cookies for school today!" he says. Yes. That is exactly what we needed to do this morning. Forget math and reading and grammar. Some days are chocolate chip cookie days. 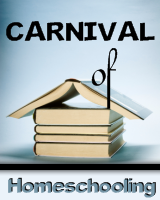 * The Carnival of Homeschooling is up at HomeschoolBuzz.com. I'm going to go spend some time there this evening. * Jesse's fall break is over, and we probably won't see him again until Thanksgiving. He has been dealing with remnants of a drama here at home for the past couple of visits. I am hoping that we can all put this behind us now and move on, away from the craziness that has been sucking the joy out of our days. * I have a friend who accused me once of sweeping things under the rug. I call it "moving on." At times like this, I ponder our difference in interpretation. * I sent half the cookies back to college with Jesse. The rest are gone already. Tomorrow, we'll do math and reading and grammar. And try to remember "normal." My writing students have always enjoyed proofreading with the Daily Paragraph Editing books. My daughter joined the Facebook craze on her 13th birthday, and one of my conditions was that she use correct grammar and spelling. She's been great about it, and I was tickled (and a little chagrined) one day to see that she'd corrected her friend's spelling on a status. So I thought: why not make daily status editing exercises for my daughter? I did a quick scan of my Facebook friends and came up with a great list. This is just one day's collection, and I'm sure I'll never run out of examples! If you'd like a change from your regular editing exercises or just to add a little variety to your grammar program, feel free to start with these and then find some more on your own. Trust me, it's easy! You can buy this assignment on Teachers Pay Teachers for just $1! In many ways, your Facebook page reflects who you are. You choose your friends, join groups, accept “Flair” and bumper stickers, add your lists of “likes,” and more. You also set our own status and make your own comments. You make the choice: will you take the time to use correct grammar and spelling, or will you take the easy way out? Directions: Each of these “sentences” below comes from an actual Facebook group or status. Your assignment is to correct these sentences. Look for errors in grammar, punctuation, capitalization, spelling, and more. Write the corrected sentence under the original. 1. almost done with homework then babysitting the adorable riley boys then church then hopefully going to eat at burger king! 2. Thank you SO Much for the Happy Birthday wishes, it makes my day a little more special. I have some great friends and an amazing Family! 3. Life isn't about Worrying. Thats a waste of time. 4. I wish you werent so far away so i could share all my happiness with you. 5. I sprang my knee n i cant get up! 7. I do believe he would have ran all morning if I did not stop him. 9. dont know my friends address but I know exactly where theyre house is! 10. We get wear jeans tomarow but not sneakers, what's the point of wearing jeans then? 11. i can’t talk to you anymore, its not that I a mad at you, it’s just that when I talk to you I realize how much I love you and when I realize how much I love you, I realize I can’t have you and that makes me love you even more. 12. I love going to a concert and loosing your voice the next day. 13. The same person who laughs, talks a lot and seems happy, may also be the person who cry’s themselves to sleep. 14. please don;t be evil, its not very nice you know. 15. i just cleaned out the friends list if your still here your lucky. 16. i have 3 tests this week two of which are tomorrow I hate this week already. Note: These are suggested corrections. There will be more than one way that a student could correct each sentence. 1. I am almost done with homework. Later I’ll be babysitting the adorable Riley boys, heading to church, and then hopefully going to eat at Burger King. 2. Thank you so much for the birthday wishes. It made my day a little more special. I have some great friends and an amazing family! 3. Life isn’t about worrying. That’s a waste of time. 4. I wish you weren’t so far away, so I could share all my happiness with you. 5. I sprained my knee, and I can’t get up! 6. I hate my English teacher. Seriously, she’s an idiot. 7. I do believe he would have run all morning if I did not stop him. 8. I’m sorry that I never texted you back; I had dinner, and then my phone died. 9. I don’t know my friends’ addresses, but I know exactly where their houses are! 10. We get to wear jeans tomorrow but not sneakers. What’s the point of wearing jeans at all? 11. I can’t talk to you anymore. It’s not that I am mad at you; it’s just that when I talk to you, I realize how much I love you. When I realize how much I love you, I realize I can’t have you. That makes me love you even more. 12. I love going to a concert and losing my voice the next day. 13. The same person who laughs, talks a lot, and seems happy, may also be the person who cries herself to sleep. 14. Please don’t be evil; it’s not very nice. 15. I just cleaned out my friends list. If you’re still here, you’re lucky. 16. I have three tests this week, two of which are tomorrow. I hate this week already. I often get to Saturday and think, "I have absolutely no idea what we did this week." That's why I rarely post a Weekly Wrap-Up. I dislike having the days all blur together. When the kids were little, each day seemed to last for eons. These days are fast ones, hopping from moment to moment, place to place. Still, we have our quiet moments at home each day, and I am often amazed at how much we get done in a few short hours. Laurel asked about homework the other day. She said that a friend at church couldn't come to Bible study because she had so much homework. "What kind of homework does she have to do in 7th grade?" she asked. "Why does she have so much of it?" I went through our day with her, explaining that while we take 15 minutes to go through a math lesson, her teacher probably takes up to an hour so that everybody understands it. And the math problems that Laurel does right after her lesson—those, I explained, would be homework. We went through our whole day like that, and I think it was very enlightening for her. I'm glad we don't have to spend our evenings doing homework. I remember what it was like when Jesse was in 1st grade, and we spent up to an hour each evening doing tedious busywork. Blech. 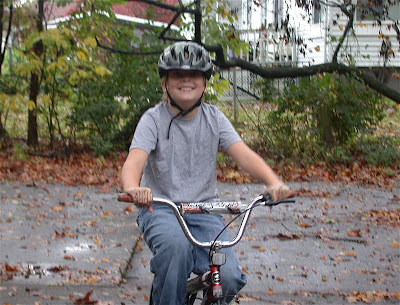 What a waste of great bike-riding, digging-in-dirt, or kicking-leaves time! Teaching Textbooks is working well for Laurel. For the first time ever I'm grading her, and she enjoys that. Still, though, how does she get these questions in her head? Are they innate? I give her an 85%, a B. "Is that good? Is that failing? That's bad, isn't it?" Good grief. Duncan is taking a few weeks off from his regular math to drill multiplication tables again. Since I skipped a whole year of math with him, I figured he'd better at least spend some more time drilling. Unlike Jesse, he loves being timed. He gets great satisfaction from beating his previous days' times. I love how each of my kids is motivated in such different ways! We finished reading The Magician's Nephew this week. Sigh. I've been reading these books for 35 years, and I still get choked up every time I read them. Now both kids are writing essays on the book. This is Duncan's first real essay, so we're totally writing it together. Laurel is comparing/contrasting how the Cabby responds to Aslan's request that he be king and how various Biblical people responded to the calling to be leaders. Duncan's topic is about miracles, based on Digory's mother's recovery. Everything else goes on as usual: spelling, grammar, vocabulary, handwriting, co-op homework, reading, science. We're slowly making it through our Focus on Scientists book, enjoying a casual year. Duncan and I have also been reading Richard Halliburton's Complete Book of Marvels. Published in 1937, this is an absolutely fascinating journey through the natural and man-made wonders of the world. Halliburton's style of writing is almost exactly like Hillyer's A Child's History of the World, and Duncan loves it. I'm not sure where my copy of this old book came from—either my family or Randy's—but it is an absolute treasure. We've been looking up the various marvels on the internet so that he can see modern-day photos of them. This is my favorite geography "program" we've done yet! 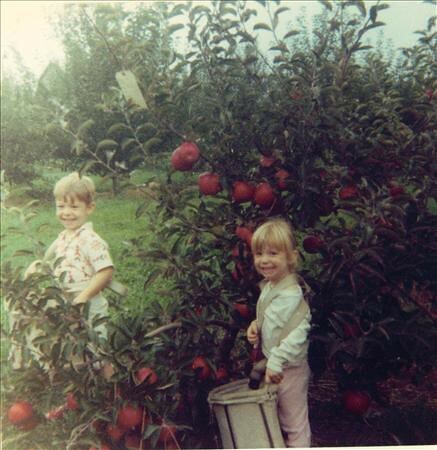 * my fourth brother is visiting from New York, and he brought a carload of apples from his orchard. * we had yearbook pictures on Tuesday. (Yes, our support group has a gorgeous yearbook.) My kids' pictures turned out fabulous, thanks to Donna. She's going to have her own photography site up soon, so watch for it, local yokels! And that's about it for this week. Randy has taken the Cub Scouts hiking on this beautiful October day, and I'm about to finish lesson plans for this Monday's co-op classes. 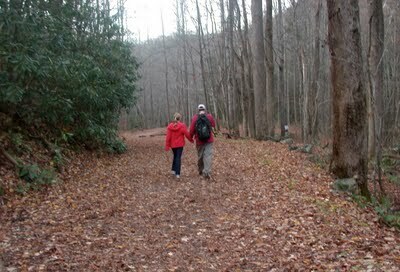 I posted pictures of our wonderful camping/hiking overnighter a few days ago. Those were from my camera. 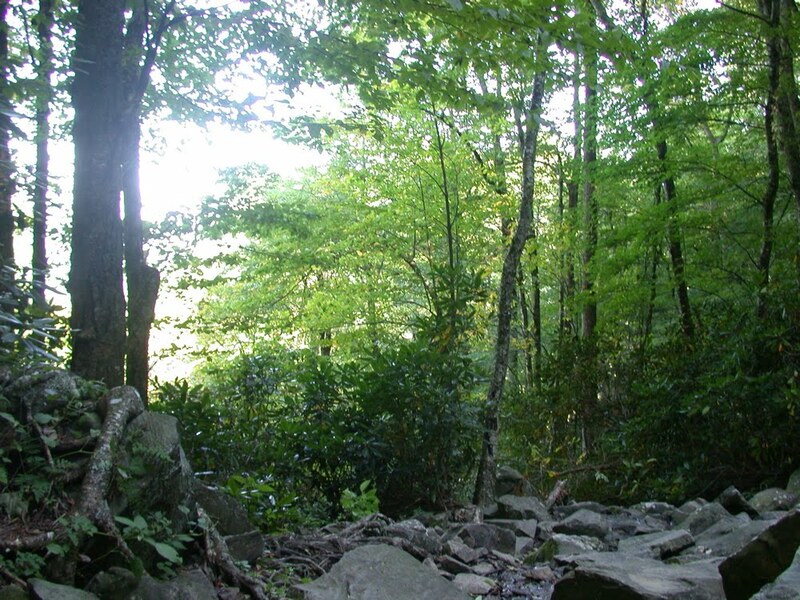 Yesterday my 13-year-old daughter downloaded her pictures; and while we had many of the same photos, she also had some that gave a completely different perspective of our hike. We didn't see any bears or a "bee nest," but we appreciated the warning. 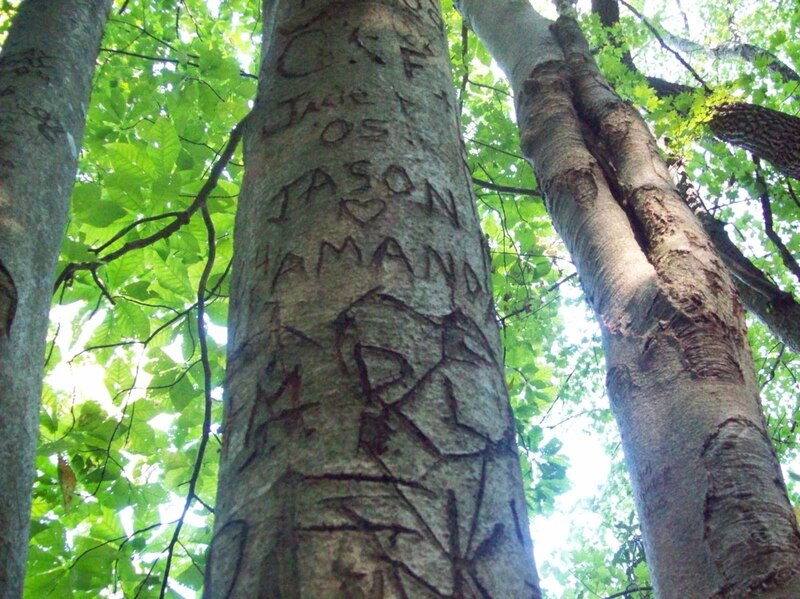 Lovers' trees. Or as my mother would say, "Fools names and fools faces often appear in public places." 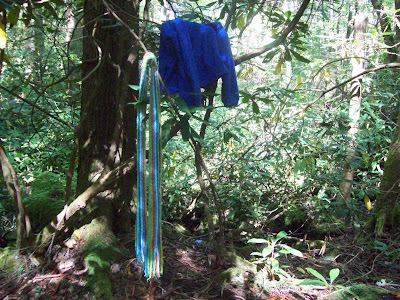 A single grave marker in the middle of the woods, off the trail. We came up with all kinds of possible stories about Jennifer. I love how my daughter captures this other perspective: the woods whispering not just with waterfall and squirrels, but with the stories other people leave behind. Welcome to the October 12 edition of the Carnival of Homeschooling! 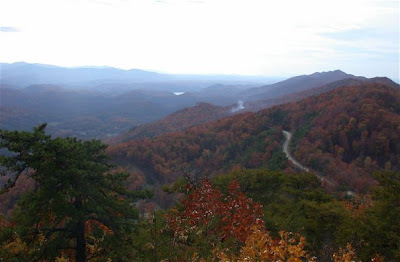 I know I'm not alone in calling autumn my favorite season, so I thought I'd take this opportunity to share some of the beauty here in the Smoky Mountains while showcasing some fantastic posts from around the homeschooling world. How can you build your child up and help him become the best person he can be? Vicki suggests various ways in her post Building a Child Up at High on Homeschool. Katherine sings the library card blues at No Fighting, No Biting! After all, she says, shouldn't homeschoolers should get special treatment at the library and be able to check out many more than a measly 30 books per card? Carolyn at Guilt-Free Homeschooling lists the Bottom 10 Worst Parts of Homeschooling. But rather than just telling you the bad news and leave you hanging, she includes valuable coping strategies for each point, based on how this real-life family survived their own "darker days of homeschooling." This is a fantastic post, filled with practical ideas! Calling all Sonlight lovers! Lips That Speak Knowledge has a Sonlight Showcase for users of Sonlight curriculum to link up, showcasing some way they’ve supplemented the curriculum or work their child has done using Sonlight. This particular Showcase also features a handwriting curriculum giveaway. This week in her homeschool co-op blogging class, Denise presents ways to make reading posts easy and fun in Week 5: Reader-Friendly Editing and Format posted at Blogging 2 Learn. Elena LaVictoire presents Why my family decided on College Plus posted at My Domestic Church. Do you have a child about to head for college? Henry explores just Where Does All the Money Go on Why Homeschool. Cristina writes about her family's growing pains as their oldest starts college in If All the Other Kids Go to College.... posted at Home Spun Juggling. While homeschooling gives us some immunity to what is planned for public schooled children, what about the zero to five ages? With changes planned for the youngest we need to educate ourselves now on the proposed changes. Heather Laurie presents Reform a nation by starting young! posted at Special Needs Homeschooling. 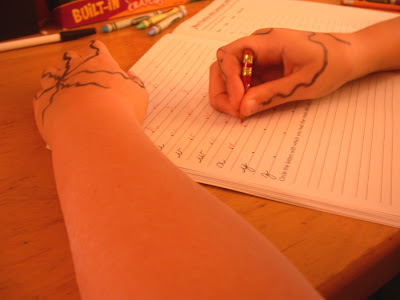 Rational Jenn has mixed feelings about her homeschooled kids' first experience with homework and the trophy-reward system at On Homework posted at Rational Jenn. e-Mom discusses the importance of the arts in education in Arts & Culture: Does Art Matter? posted at C h r y s a l i s ?. Denise of Let's Play Math! presents math puzzles called soriteses or polysyllogisms in Lewis Carroll’s Logic Challenges. 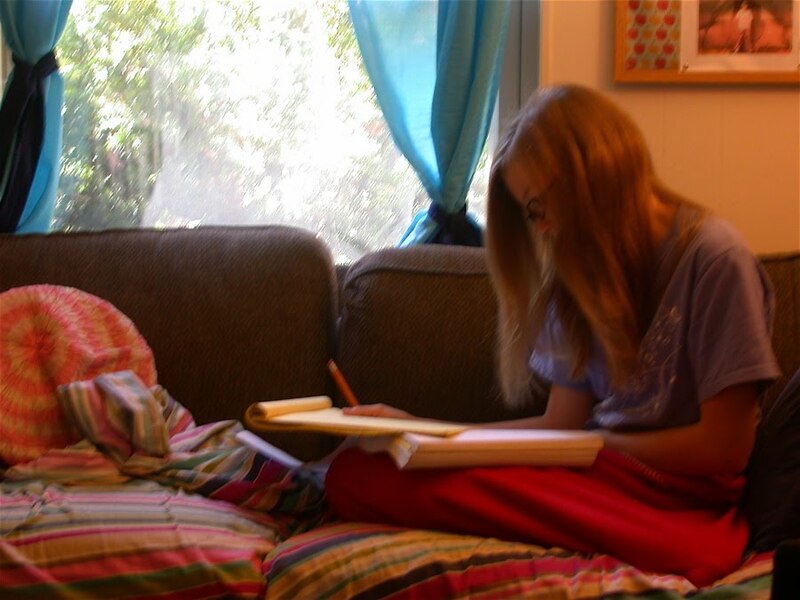 Illinois public school authorities have some misconceptions about homeschooling rights. 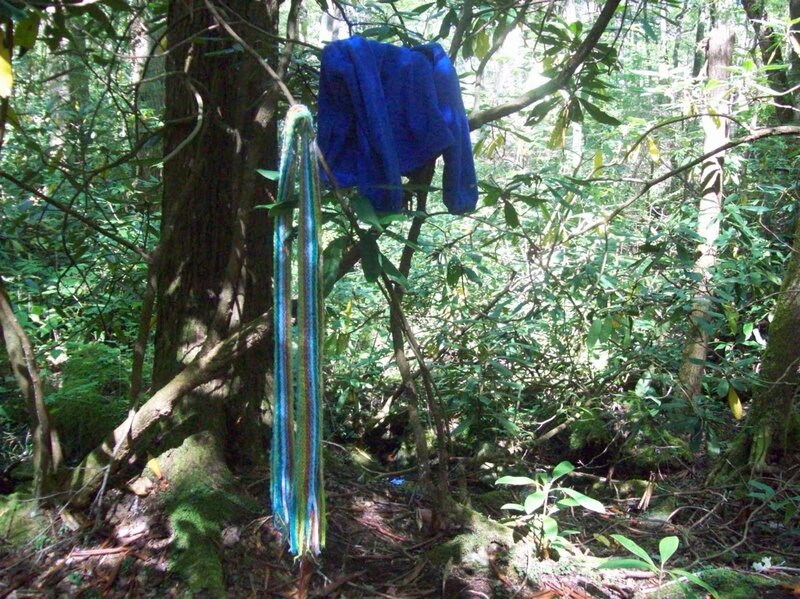 Susan Ryan provides some explanations in Regarding Learning Time posted at Corn and Oil. In her post Wish You Were Paid to Homeschool Your Children?, Barbara Frank of Barbara Frank Online says that while there's a government that pays parents to homeschool their children, you should also consider the downside. Finally, if you're looking for some resources and activities for celebrating autumn, check out my recent post here on SmallWorld. And then consider hopping over to The Homeschool Classroom to read my post Biting Into Apples. I hope you'll spend some time enjoying this season! I hope you've enjoyed this edition of the Carnival of Homeschooling. As always, thanks to Henry Cate at Why Homeschool for running the carnival. Tune in next week at Homeschool Buzz for another great carnival. Anyone can submit an article. Just pick one of your favorite homeschooling posts and fill out the submission form by Monday at 6 p.m! Come on over to The Homeschool Classroom for the rest of the post! And be sure to visit me tomorrow; I'll be hosting The Carnival of Homeschooling right here on SmallWorld! You can submit your homeschooling-related post here until 6 p.m.! Autumn is definitely here in East Tennessee, in spite of temperatures in the 80s. The driveway is covered with leaves and the first hints of fall color are showing up in the trees. 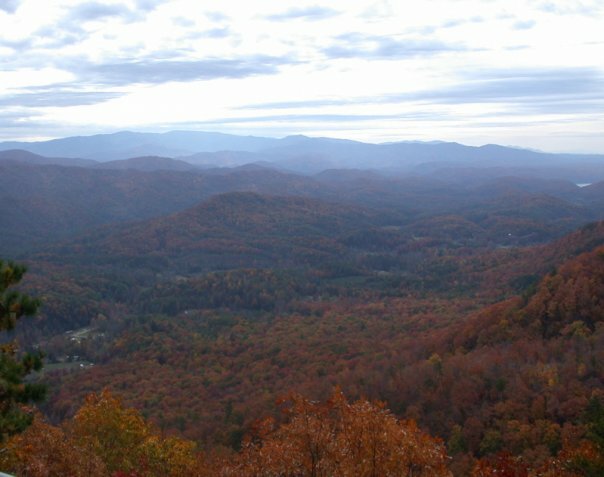 Because the Smokies get tons of visitors in autumn, the question is always: what kind of fall color will we have this year? The happy fact is that even in years, like last year, when the prediction is that we'll have a "low color" year, autumn is gorgeous around here. 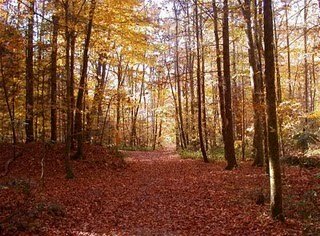 In celebration of this perfect season, I thought I'd share some of my favorite resources for fall. Autumn Leaves by Ken Robbins is by far our favorite leaf book. After a brief discussion about leaf characteristics and why leaves change c olor, Robbins shows the reader leaf colors from trees across the country, with close-up photographs of leaves as well as photos of whole trees for easy identification. This book spans several ages. The text is simple enough for preschoolers but not too simplistic for middle readers. I think it's just a great guide book. 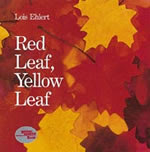 For preschoolers and early elementary children, Lois Elhert's Red Leaf, Yellow Leaf is an explosion of beautiful, rich color. 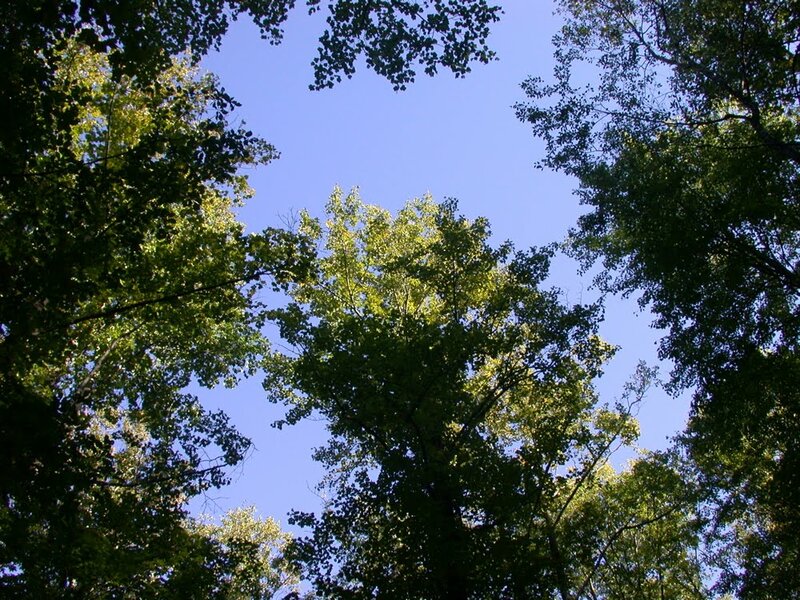 The book traces the life of a sugar maple from seed to sapling. 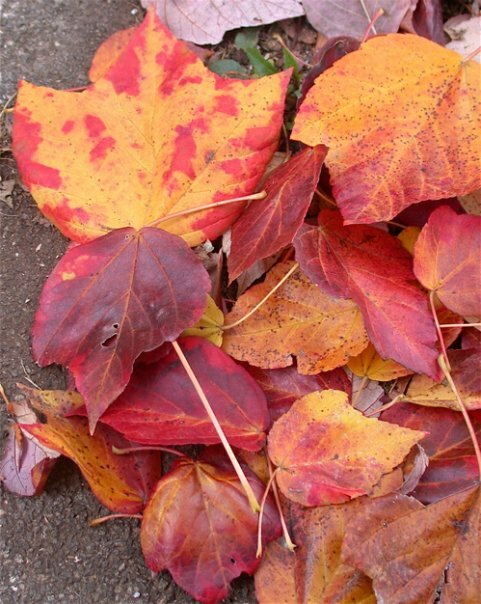 Kids will want to get out craft supplies and make leaf collages after reading this one. The Let's Read and Find Out Science series has a good resource book, Why Do Leaves Change Colors? for young readers (preschool/early elementary). It's simple, with good detailed illustrations of leaves and a couple of easy craft ideas. I've always loved authors Gail Gibbons and Anne Rockwell for probably ages 3-6. Both authors have a voice I appreciate; they don't talk down to children or dumb down their explanations. 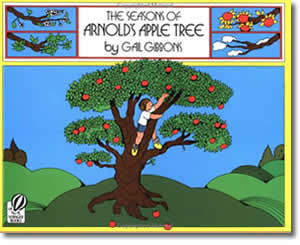 Gibbons The Seasons of Arn old's Apple Tree, which takes the reader through the changes in an apple tree though the seasons, was one of our favorite autumn books. We also enjoyed Rockwell's colorful Apples and Pumpkins. Perhaps my favorite preschool pumpkin book, however, is Jeanne Titherington's Pumpkin Pumpkin. I bought this books at a lovely toy store called The Pumpkin Patch in Ames, Iowa, where we lived when Jesse was a preschooler. I love the gentle colored pencil drawings and the little boy who looked so much like my own child. • Fall Leaf Guide is an easy guide to identifying trees by the color and shape of foliage; the chemistry, physics and geometry of fall color; and more. Sounds complicated, but the explanations are very short and sweet. 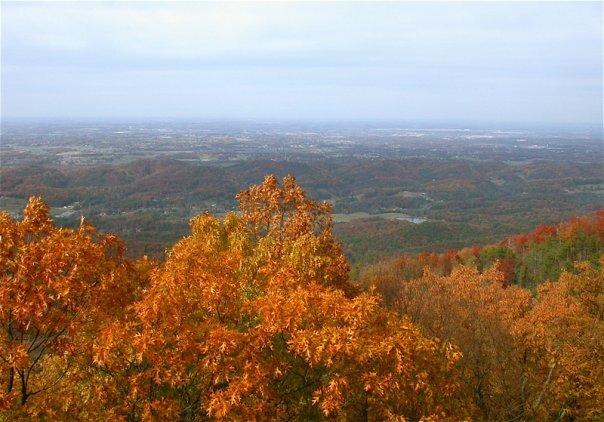 This guide highlights Tennessee trees but can be used wherever seasons change. 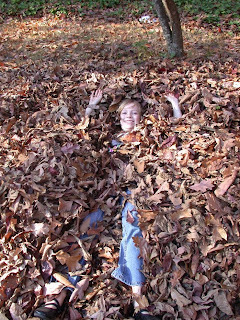 Of course, most importantly, get out and play in the leaves! 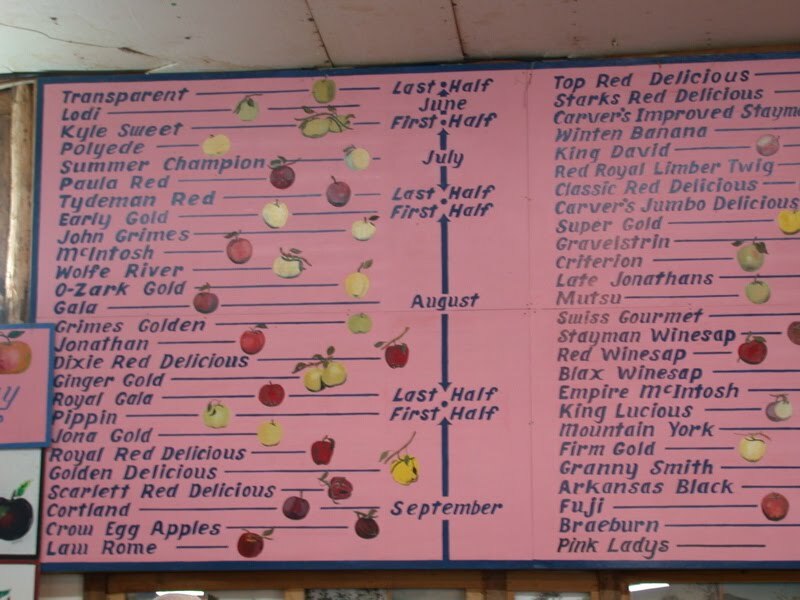 On the way home, we stopped at an apple orchard in Cosby, TN that I'd read about. And their display of apples. But not being able to U-pick pretty much defeats the whole purpose of an apple orchard for me. If you are a regular reader, you know how I feel about apples. 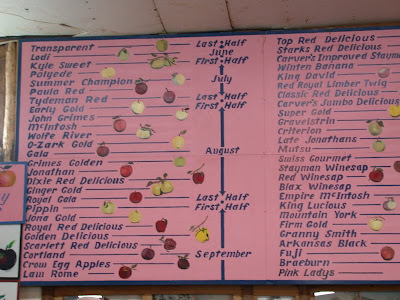 If you're new, read this post on apple picking and this post on being a fruit snob and you'll understand. But I really did like their pretty pink sign. 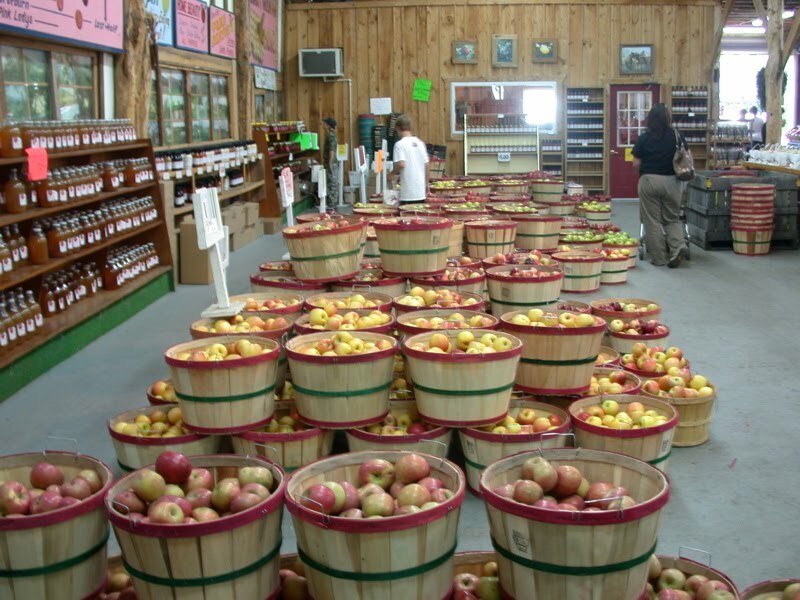 We bought two bags of apples, a gallon of cider, and some apple butter. 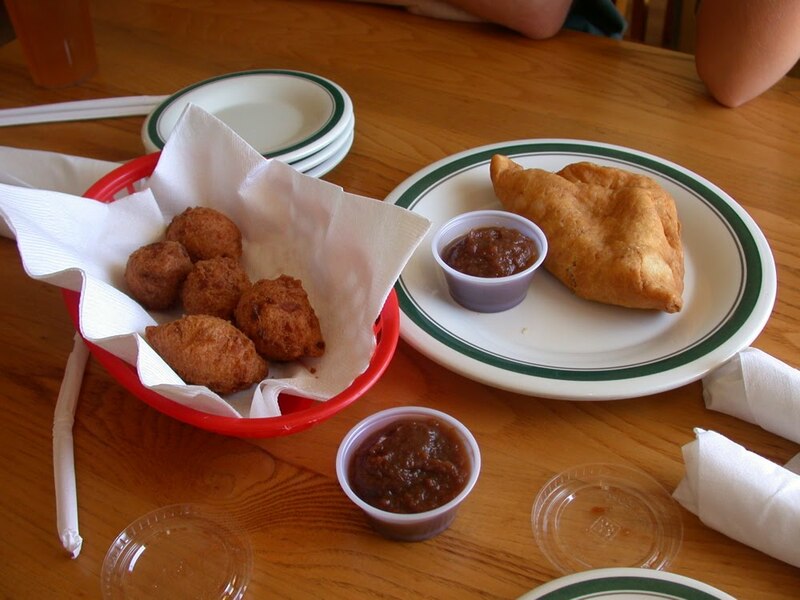 We also tried their apple fritters and fried apple pie, which internet reviewers claimed one "can't miss." They were tasty but not terribly exciting. I am a curmudgeon, aren't I? 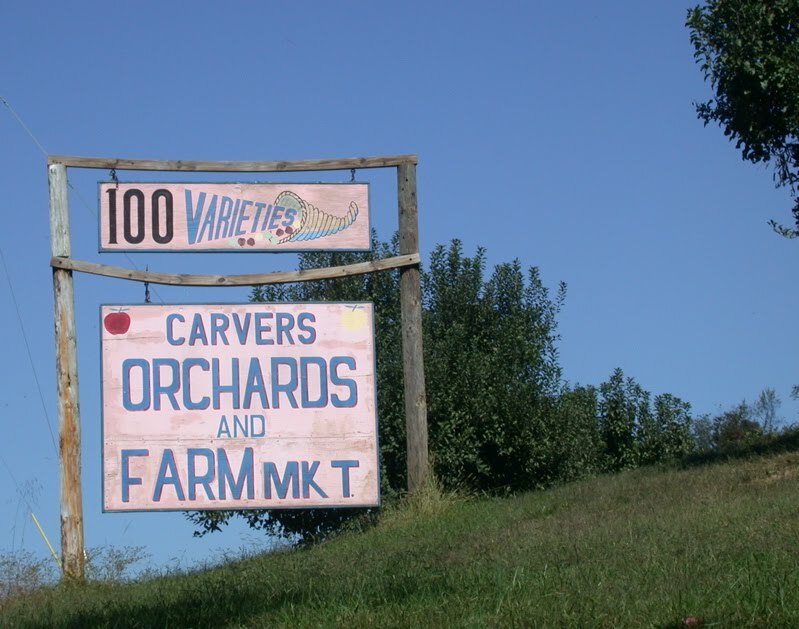 Still, I was glad to visit an apple orchard if only just to smell apples and be reminded of the countless days of my childhood I spent surrounded by apples, trees, and my family men in workboots and leather gloves, smelling faintly of tractors. * You know what I'm really happy about? We're going camping tomorrow. I am going off the grid. 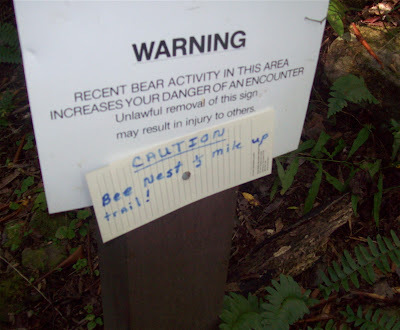 We'll be having no drama other than perhaps some bickering between the kids and maybe a bear will wander into camp. Somehow that seems mild. 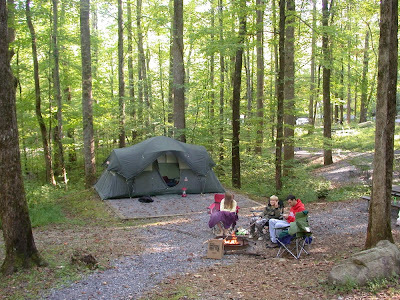 I'm looking forward to a blazing campfire, s'mores, and a quiet hike. * I wish we could go for longer, but our city has a big 3-day fall festival each year. Our church is right across the street from the main concerts, and providing parking in our church lot is our youth group's main fundraiser each year. We'll be coming back to help with that, plus Jesse is coming home for the weekend. He wants to see Lynard Skynard! * I have to make myself blog lately. Somehow in the face of greater things, blogging can all seem so inconsequential. From dealing with petty teen angst to real tragedy, I am weary. And yet I love the process of stringing words together and figuring out where I am while doing so. Always have. Writing is my safe haven, my city of refuge. * You know what really irritates me? That big-mouthed dog of ours and her sharp, ear-shattering bark. Why do we have a dog, anyway? * The end. Dr. H. is home, cookies are finishing up in the oven, and we have a Cub Scout pack meeting to get ready for. * This is pretty much as close as I get to whining. Sorry about that, but I've heard so much adult whining lately, both reasonable and unreasonable, that I wanted to add some of my own. When I come home from camping, I hope to have taken a few very big breaths and be back to my cheery self. I just had a big bowl of leftover Chicken and Rice Soup for lunch, and I'm telling you: if you haven't tried this soup yet, please do not wait any longer! It is sooooo amazingly good and easy, and you absolutely must have it on a chilly, damp autumn day. By the way, I left out the green peppers, celery, and pimentos because we didn't have any of those, and Dr. H. liked it much better. This week is one of those weird hit-or-miss supper weeks. We have a pack meeting one night, which means Dr. H. won't eat; we're going camping another night, which means camping food; and this weekend is our county's huge fall festival, which means we'll be parking cars at our church. But I'm making out a menu anyway, anticipating that we'll at least have a few normal meals at home. I'm going to be bold and try this Chicken with Olives on Pioneer Woman Cooks. This will be a bit of a risk in our house because: 1) Dr. H. doesn't like olives; 2) Dr. H. doesn't like chicken on the bone; and 3) Dr. H. doesn't like chunks of cooked tomato. But he did say, "I'll try it," so we'll see how this goes. The good news is that this is served on a bed of linguine, so all picky eaters can just eat linguine. I might be eating a lot of chicken and olives this week. I found another one at Pioneer Woman that I have to try this week: Pasta with Tomato-Blue Cheese Sauce. If you need more heavy cream and butter in your life, Pioneer Woman is always the best place to go. Serving up a side of PW's Buttery Bread will greatly enrich any pasta experience. The rest of the week will be old favorites. Our vegetarian college son will be coming home this weekend, and he's requested Lasagna and Baked Potato Soup (sans bacon). I'm also going to be crazy and make a pumpkin pie for him, even though it's not Thanksgiving. I don't know what's come over me. I made the most delicious lemon bars yesterday. I can hardly stop eating them. Cream together 1 cup flour, 1/2 cup butter, and 1/4 cup powdered sugar. Spread in a greased 8 X 8 inch pan and bake for 20 minutes at 350. While that's baking, mix together 2 eggs, 1 cup sugar, 3 TB lemon juice, 1/8 tsp. salt, and 2 TB flour. Pour over the crust when it's done baking. Return to oven and bake about 25 minutes at 350. Cool, then sprinkle with powdered sugar and cut into bars. These are ridiculously delicious and so easy to make, especially if you don't have anything else dessert-ish in your house. And that's what we'll be eating at SmallWorld this week. Clogged bathroom sink. Dog poop on the floor. Ant spray. Cats meowing outside the window, demanding their morning meal. A sink and counter full of dishes. A broken screen. Dining room table cluttered with junk. Noisy boys up too early. A sneezing, sniffling husband. A day ahead full of lesson plans. A bowl of Cocoa Puffs and a cup of coffee. 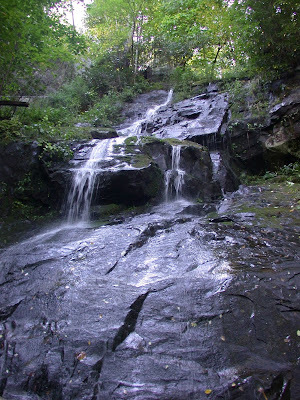 A favorite Psalm with my morning reading: "Let the rivers clap their hands in glee! Let the hills sing out their songs of joy before the Lord." Birdsong and chill coming through the open windows—fall really is here. A day ahead with nowhere to go and plenty of free time to get lesson plans done, do dishes, and straighten the house. Overnight friends for both of my kids: little boys giggling on the floor, teenaged girls still sleeping soundly. Cool weather for a morning run. Anticipation of waffles and sausages for brunch. Every day is a choice. You pick.